2aSC7 – Effects of aging on speech breathing -Simone Graetzer, PhD., Eric J. Hunter, PhD. The aging population is the fastest growing segment of the population. Some voice, speech and breathing disorders occur more frequently as individuals age. For example, lung capacity diminishes in older age due to loss of lung elasticity, which places an upper limit on utterance duration. Further, decreased lung and diaphragm elasticity and muscle strength can occur, and the rib cage can stiffen, leading to reductions in lung pressure and the volume of air that can be expelled by the lungs (‘expiratory volume’). In the laryngeal system, tissues can break down and cartilages can harden, causing more voice breaks, increased hoarseness or harshness, reduced loudness, and pitch changes. Our study attempted to identify the normal speech and respiratory changes that accompany aging in healthy individuals. Specifically, we examined how long individuals could speak in a single breath group using a series of speeches from six individuals (three females and three males) over the course of many years (between 18 and 49 years). All speakers had been previously recorded in similar environments giving long, monologue speeches. All but one speaker gave their addresses at a podium using a microphone, and most were longer than 30 minutes each. The speakers’ ages ranged between 43 (51 on average) and 98 (84 on average) years. Samples of five minutes in length were extracted from each recording. Subsequently, for each subject, three raters identified the durations of exhalations during speech in these samples. Two figures illustrate how the breath groups changed with age for one of the women (Figure 1) and one of the men (Figure 2). We found a change in the speech breathing, which might be caused by a less flexible rib cage and the loss of vital capacity and expiratory volume. In males especially, it may also have been caused by poor closure of the vocal folds, resulting in more air leakage during speech. Specifically, we found a decreased breath group duration for all male subjects after 70 years, with overall durations averaging between 1 and 3.5 seconds. Importantly, the point of change appeared to occur between 60 and 65. For females, this change occurred at a later time, between 60-70 years, with durations averaging between 1.5 and 3.5 seconds. 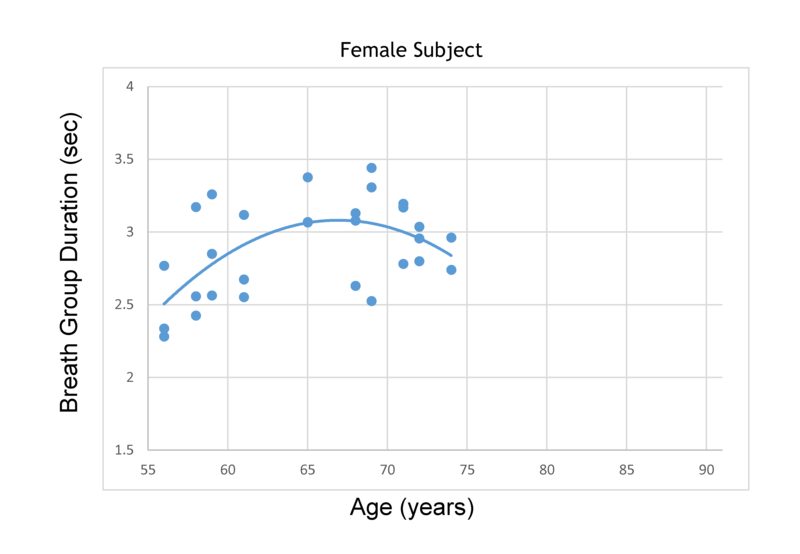 Figure 1 For one of the women talkers, the speech breath groups were measured and plotted to correspond with age. The length of the speech breath groups begins to decrease at about 68 years of age. 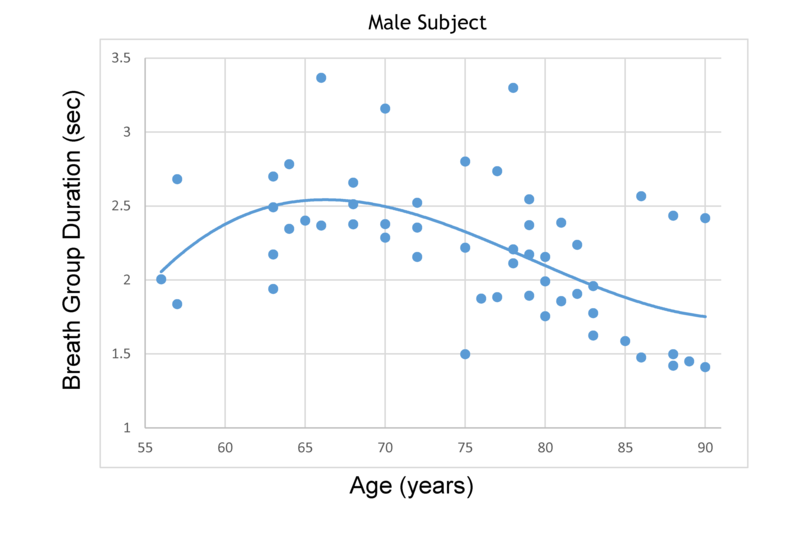 Figure 2 For one of the men talkers, the speech breath groups were measured and plotted to correspond with age. The length of the speech breath groups begins to decrease at about 66 years of age. The study results indicate decreases in speech breath group duration for most individuals as their age increased (especially from 65 years onwards), consistent with the age-related decline in expiratory volume reported in other studies. Typically, the speech breath group duration of the six subjects decreased from ages 65 to 70 years onwards. There was some variation between individuals in the point at which the durations started to decrease. The decreases indicate that, as they aged, speakers could not sustain the same number of words in a breath group and needed to inhale more frequently while speaking. Future studies involving more participants may further our understanding of normal age-related changes vs. pathology, but such a corpus of recordings must first be constrained on the basis of communicative intent, venues, knowledge of vocal coaching, and related information. Hunter, E. J., Tanner, K., & Smith, M. E. (2011), Gender differences affecting vocal health of women in vocally demanding careers. Logopedics Phoniatrics Vocology, 36(3), 128-136. Janssens, J.P. , Pache, J.C. and Nicod, L.P. (1999), Physiological changes in respiratory function associated with ageing. European Respiratory Journal, 13, 197–205. We acknowledge the efforts of Amy Kemp, Lauren Glowski, Rebecca Wallington, Allison Woodberg, Andrew Lee, Saisha Johnson, and Carly Miller. Research was in part supported by the National Institute On Deafness And Other Communication Disorders of the National Institutes of Health under Award Number R01DC012315. The content is solely the responsibility of the authors and does not necessarily represent the official views of the National Institutes of Health.